Bench DJ comp winner – DJ Dave Crane! – The global community for audio culture. Bench DJ comp winner – DJ Dave Crane! A week last Thursday night, the Bench DJ Competition final took place at the cool NoHo bar in the Northern Quarter of Manchester; this was a night of great music and saw the Bench Parklife DJ Competition winner from this summer, Rob Drake, play a set too. The final of the Bench DJ Competition, in association with The Warehouse Project, Mixcloud, SAE & Vestax, kicked off on Thursday night at NoHo bar in the Northern Quarter of Manchester. Five finalists battled it out to be crowned winner, each playing a 30 minute set to a packed crowd and judges from the industry, including electro trio The Japanese Popstars, Paul Nolan, Head of Electronic Music Production for SAE, Lee Stone, Promotions Manager for The Warehouse Project, and representatives from Bench. DJ Dave Crane from Leeds won the phenomenal prize, winning a New Year’s Eve set at Warehouse Project, the chance to play at Bench events next year, a £2,000 course in Electronic Music Production from SAE & £1,000 worth of software and equipment from Vestax. Not short of experience, Dave has been DJing for over 15 years and plays House, Tech, Techno and Classics. He can be foundon SS Radio every other Monday on his House Mates Show, showcasing guest mixes from DJs like Jonathon Ulysses, MYNC Project, Timo Garcia & Mark Mendes to name a few. Over his career he has played alongside names such as Carl Cox, 2 Many Djs, Judge Jules and Zombie Nation amongst others, while playing for events like Euphoria, Gatecrasher, 4Clubbers, Life’s Chemistry, Blend & Echo. 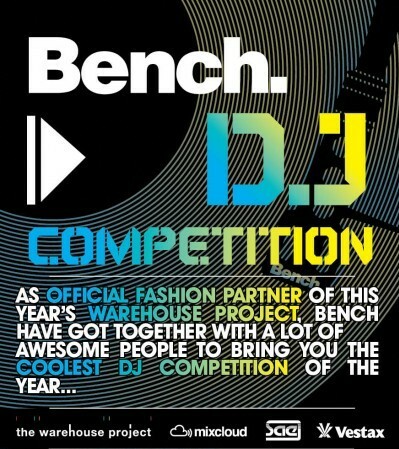 How did you first hear about the Bench DJ competition? I was reading Resident Advisor when I saw the post. This was the first time I heard of Mixcloud too, two good finds in one day, I use Mixcloud all the time now. What made you want to enter the competition? I have been entering DJ competitions for years and have won a few too. I entered the Cream DJ Comp a few years ago and got to the finals where the Cassette Jam boys won it. After that competition, not many others really attracted me until I saw the amazing prizes for winning the Mixcloud & Bench one. How did you go about making your mix, what went into selection choices, what equipment did you use? I used Pioneer CDJs and equipment to make the mix. I wanted to create a party atmosphere with the mix but keep it sounding fresh and original. I sifted through all my tunes and settled on a few current releases mixed in with some classics from the last couple of years which represent my style. I always feel that an introduction is important when preparing sets like this as you need to stand out from the others. Its hard to make a set flow and progress within half an hour, so I edited the tunes in Ableton to enable me to make the mix flow better and include more tunes. I mixed the set live on 3 CDJs. How did you promote your mix / entry? I informed all my friends on Facebook, Myspace and in my group. Emailed friends and family and networked with some of the people on Mixcloud. I also used my House Mates radio show to promote the entry and messaged all the Dance music forums too. How did you feel when you found out you’d qualified for the finals? When I got the email from Kayley at Bench I was over the moon! Out of the 100s of talented entries from around the world and all the different genres, I managed to to stand out from the rest! It was an amazing feeling! What was your strategy for the final, did you prepare / practice in advance? I practice most days, keeps me out of trouble ;-). I knew I needed a completely new set and so went through similar process as last time but added a few special extras to stand out. How does it feel now you have won, are you canceling your NYE plans? Do you have nything else to say, any shout outs? I would just like to thank all my friends and family for all their support and encouragement – enjoy the music and hopefully I will see some of you soon!